Vinegar To Clean Hardwood Floors - Does It Work? Myth or Reality? Using Vinegar To Clean Hardwood Floors - Does It Work? Myth or Reality? Can you use vinegar to clean hardwood floors? One of the most prevalent purported uses for vinegar, as a cleaner, is to clean your hardwood floors. But it just isn't so. As discussed more in-depth in my article on how vinegar can and cannot be used for cleaning, vinegar does not cut grease, and does not have surfactants to carry away dirt and oil. Vinegar is an acid, and as such is not a good general cleaner for dirt, which is also generally acidic in nature. Your hardwood floor will get dirt and some grease and oil on it in the process of living your daily life. Vinegar will not do a good job in removing that dirt and grease. So the bottom line is this -- you can wash your hardwood floors with vinegar and water, but your floors will eventually get really dirty because vinegar will not clean them well like a mild soap or detergent will. Want To Know How To Clean Hardwood Floors? 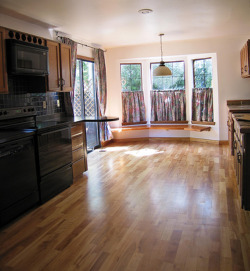 Read my article on how to clean hardwood floors, which includes an instructional video.